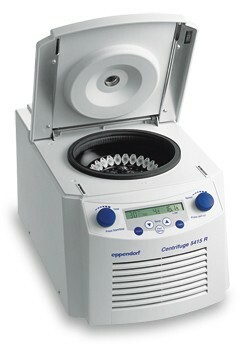 Microcentrifuge 5415 R is an ideal workhorse for the lab. It features easy-to-use control knobs and a digital display of time and speed. Speed can be displayed in rpm or g-force, which saves you the time of performing tedious calculations and improves reproducibility. A separate, adjustable-speed Short Spin button provides easy, quick spins. The timer can be set to 99 minutes or continuous runs. As the smallest and quietest refrigerated microcentrifuge on the market, Model 5415 R's compact cooling system and Fast Temp function quickly cools the chamber to 4°C (set temperature) in just 16 minutes. It can maintain 4°C, even at maximum speed—eliminating those countless trips to the cold room. Standby cooling also maintains chamber temperature when the centrifuge is not in use. There are no threads in EPPENDORF 5415R Reviews at this time.